Hello, this is Adair Heitmann writing to you about never giving up on writing. 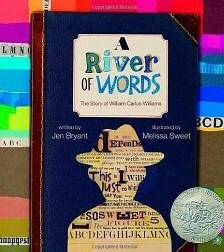 Recently I met the illustrator of A River of Words: The Story of William Carlos Williams. Melissa Sweet lives in Maine and ventured down for a children’s book festival at a local library. Her colorful, quirky collage illustrations blew the artist in me away. Then I read the words in the book. Author Jen Bryant tells the true story of William Carlos Williams who was a doctor by day and a poet by night. For the writer in me who has a day job, this book encouraged me to keep going, keep writing, keep pouring my soul onto the paper, because that is what I have to do. If Dr. Williams could go up into his attic late at night and write poetry, I can too. Take heart all you writers out there who have to bring home the bacon, there are others who have walked before you, you are in good company. By the way, don’t let the children’s book genre fool you. This book is for writers of all ages! In fact I’m giving a signed copy of it as a birthday present to a writer friend of mine who is also a psychotherapist and organic farmer.